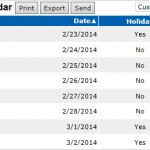 TeamDesk supports Date, Time, and Timestamp columns. Timestamp is the combination of the date and time. You may construct the timestamp from the date and time using ToTimestamp(date, time) function. The reminder can be set up to use either date or timestamp column. The date column in reminders behaves exactly the same as timestamp constructed from the date and the midnight time (0:00 a.m.). It is triggered on the date and time specified in the column’s value (or midnight for the dates). You may optionally specify the offset to send the reminders some days after or before. The problem is that we can not specify the offset in the units other than days. The solution would be to calculate the moment in time to send the reminder. The calculation can be done via Formula – Timestamp columns. Let’s name it Reminder Time. The reminder should use this column and specify 0 as the offset.